LeBeau means the beautiful and Grande means large and this designer series light is the beautiful light, but huge in size and gives the grand look to outdoors. The LeBeau grande is one of the types of LeBeau model but it is impressive in size and appears to be splendid. It is of the size 14" wide x 39" tall with a projection of 20 1/2" from the wall. This is the "Big Brother" to the PF190 and makes a great addition to it for larger areas. 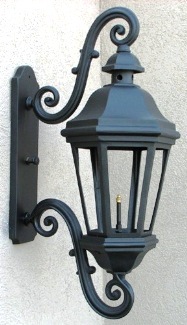 When ordering this as an electric type, it includes FIVE way candelabra bulb holder with a maximum wattage of 60 each.